Larry Scarpa, USC School of Architecture adjunct professor and co-principal of Brooks + Scarpa, is considered a pioneer and leader in the field of sustainable design. Co-principal Angela Brooks oversees development in the areas of housing and policy, leading the firm’s sustainable initiatives and overall management. 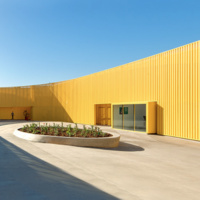 BROOKS + SCARPA has received more than 50 major design awards, notably 22 National AIA Awards, including the 2017 National American Institute of Architects Collaborative Achievement Award, 2017 AIA Gold Medal from the Los Angeles chapter, the 2016 AIA California Council Lifetime Achievement Award, 2014 Smithsonian Cooper-Hewitt National Design Museum Award in Architecture, the 2010 National and State of California AIA Architecture Firm Award, and six national AIA Committee on the Environment “Top Ten Green Building” awards.